"A hearty and creamy meat, potato, and corn chowder." Combine potatoes, salt, marjoram, and water in a soup pot. Boil until potatoes are just tender. Brown sausage and onion in a skillet over medium heat. Drain off excess fat, and add to the potatoes. Stir in the cans of corn and the evaporated milk. Heat through, and serve. This was easy to make, but I thought it had a distinct canned corn taste. It seemed quite sweet...I would consider trying it with frozen corn. This is a fantastic chowder and so easy!! 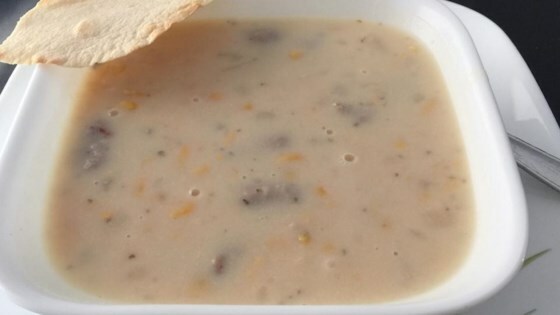 My husband is from New England and is picky about his "chowdas", he loved this and so did I! This was really good! I made a couple changes though, I didn't peel the potatoes and I added diced carrot and celery and used smoked sausage. Delicious!! So good! I loved this and will definitely make again. I used two cans of creamed corn and omitted the can of whole kernel corn. Also added two chicken bouillon cubes to the water.